We just found an incredible vegan resource in LA: Spork Foods! 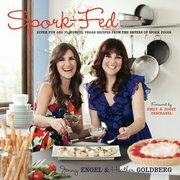 Spork Foods of LA & Vegan Cookbook: Spork-Fed! Spork Foods is a Los Angeles-based gourmet vegan food company owned and operated by sisters Jenny Engel and Heather Goldberg. Spork Foods was also a winner of the 2010 VegNews Veggie Awards!